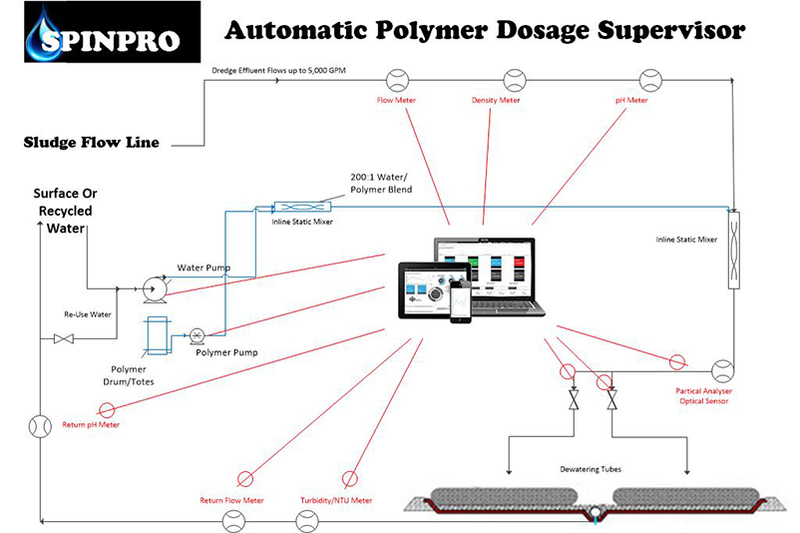 The SpinPro AutoFloc Automatic Polymer Flocculation Control System is a chemical control system used to optimize flocculant and/or coagulant dosage on dewatering applications including but not limited to screw presses, belt presses, dewatering tubes (Geo-Tubes), centrifuges, clarifiers and DAF;s. The system utilizes a microprocessor based controller in conjunction with a suspended solids or color monitor to continuously monitor and regulate the effluent quality. Optional feed forward inputs of flow and suspended solids allow faster adaptation to influent steam variations. The self-tuning PID controller eliminates overdosing and insures consistent process operation. The basic principle of the SPINPRO AutoFloc is to make small changes in the chemical dosage and look for matching variations in the feedback signal. In dewatering or clarification applications, the feedback signal represents the Total Suspended Solids (TSS) in the filtrate. Filtrate TSS has proven to be an excellent indicator of the effectiveness of polymer dosage. 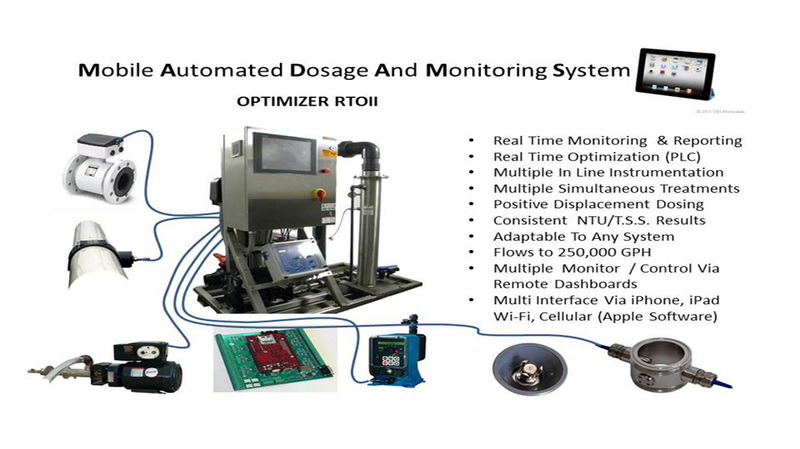 By measuring the change in TSS associated with small changes in chemical dosage, the controller can calculate the path of the system and determine where on the chemical dosage curve it is operating. The polymer dosage curve above shows a typical process response to polymer dosage. In the effective dosage range, increases in chemical dosage result in improved separation and a significant decrease in filtrate TSS. 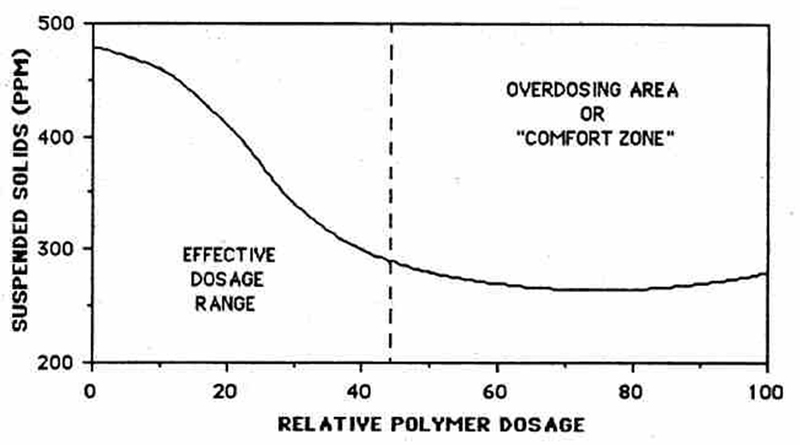 In the overdosing area, or “comfort Zone,” increased polymer dosage does very little to improve separation and can often result in even higher TSS. In most processes controlled manually, operators will maintain dosage somewhere in the comfort zone. The gives the operator a cushion so that an increase in polymer demand will not cause an upset. By utilizing the feedback principle described above, the AutoFloc determines whether its operating set point is in either the effective dosage range or in the comfort zone. If the set point is achievable without overdosing, the AutoFloc will function as a self-tuning PID controller; maintaining the effluent at the chosen set point by continuously adjusting polymer dosage. Unlike other controllers, however, if the process changes and the set point is no longer achievable, the AutoFloc will not operate in the overdosing area trying to reach that set point. Instead, it will realize that the process is no longer responding to increases in polymer and it will reduce chemical dosage until it crosses back into the effective dosage range. It will continue to operate on the “elbow” of the dosage curve until it finds it is able to reach the desired set point without overdosing. This action eliminates overdosing, resulting in a significant decrease in polymer use. The adaptable sensors integrate directly to the dredge/pump pipeline to monitor and treat sludge prior to the de-watering tubes and/or de-watering devices. As the slurry passes the floc analyzer, feedback is sent to the polymer dosage controller. The information is inter read with other parameters including flow, trending, etc. to calculate and dose the slurry with the optimal amount of polymer. This not only minimizes the amount and cost of treatment, but ensures that the materials have not been under dosed or overdosed. Absence of constant optimization can cause process swings and will lead to poor de-watering and resulting in higher TSS and more water remaining in de-watered sludge. Other features include instantaneous polymer solution adjustments, ability to de-water with liquid or dry polymers, enhanced treatment with multiple injection points, adaptable to any size pipeline, and has the capability of sending wireless data to a monitor dredge. The operation of the dredge can further optimize throughput, quality, etc. with real time monitoring. The treated slurry is then moved to the de-watering application such as Geotextile tubes, traditional containment or other methods of de-watering and processing. The PLC provides real time information of the process which then can be printed, stored or monitored from a remote location.